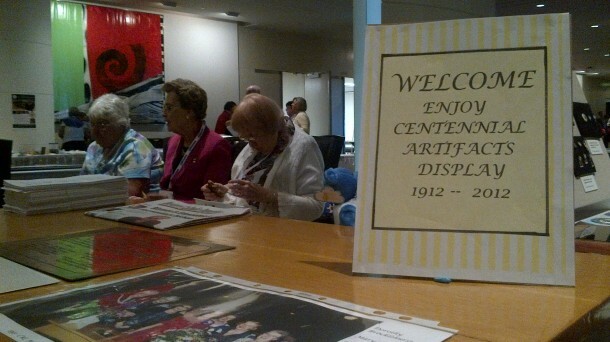 At the Catholic Women's League annual convention, three long time members sit behind their Centennial Display, a collection of CWL memorabilia spanning the organization's one hundred years of existence. From left to right: Rose Marie McCarthy (member for 50 years) Mary Ann Warren (member for 53 years) and Natalie Carley (member for 62 years). The CWL is a lay organization for women that was started in Edmonton in 1912 by Canadian journalist Katherine Hughes.